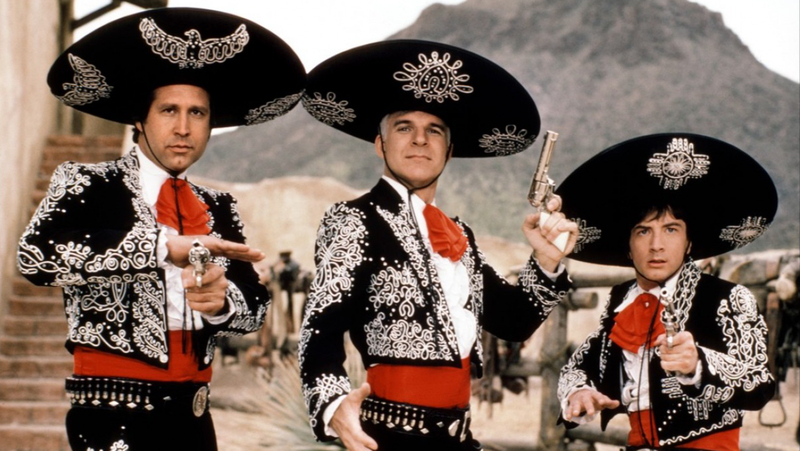 It’s the height of the silent film era, and one of the big acts is The Three Amigos – a trio of heroes who play Mexican heroes who ride into small towns to save them from evil warlords. However when the three actors, Lucky Day (Steve Martin), Dusty Bottoms (Chevy Chase) and Ned Nederlander (Martin Short) get too big for their boots and end up out of work, they need to find a new way in life. A telegram comes from Mexico offering a huge reward if they turn up for a show – however they do not realise it was from Carmen (Patrice Martinez) a girl from a small town threatened by the evil El Guapo (Alfonso Arau), and she does not understand that movies are not real. When they arrive and find all is not showbiz, they show their cowardly side. But, they cannot in all conscience leave Carmen to El Guapo and his evil ways. This is most definitely a classic comedy. Well structured with lots of ridiculous jokes, tonnes of slapstick and is the best work of all three leads. I love this film and I will always love this film.